I hope you’ve enjoyed looking over my shoulder during this sketching challenge. You might wonder how I choose what I’ll sketch. During the day I’m on the lookout for interesting subjects-interesting to me and to you. Sometimes sunlight will land on an object and I’m just drawn to it. Sometimes I want to share a view or something like these luscious blueberries with you. I nibbled on nearby berries as I sketched these, then I ate them! I’m sure the neighbors were wondering why I was staring up at this power pole. This bottle of olive oil looked so humble in the light. This is a bit of a self-portrait. I drive my big yellow studio about 200 miles a day. I often stop and sketch after I’ve dropped off the students. At Eureka Summit I stopped and sketched this from my big yellow studio. The poles are there to mark the road during snow storms. On the Glenn Highway, there is a section where the land flattens out and little lakes dot the landscape. I always feel like yodeling here. It’s a bit Narnian, isn’t it? I’ve been asked to take part in a sketching project originating in South Africa. People from around the world are joining me to sketch every day in August in this sketch pack they sent. The owner of an art supply store in Cape Town, called ArtSource, invited me and I had to say yes. At the end of the month, we all will send our little packet back to her and they will be on display and for sale for the month of October. I’m posting my sketches daily on Facebook if you would like to follow me there. I’ll post here every week as I don’t want to overload your inbox. Our deck is going crazy with nasturtiums! My guitar waiting patiently for me to stop sketching and play. Palmer with the mountains as a backdrop. Most of the time while I’m sketching people just walk on by, but when I sketched the little scene of Palmer, above, a policeman, a biker, and a friend stopped to visit. The policeman wanted to tell me about his sister who paints, the biker thought I had a flat tire and stopped to help, almost deafening me as he went by (twice) on his motorcycle, and the friend was happy to just visit. The pastoral vibe in the sketch came from somewhere, but not from the atmosphere around me. I’m having a hard time not sketching just flowers because they are just amazing this year with our record heat. I made a wonderful pizza on the grill last week and a peach galette. Maybe I’ll sneak in a post with those recipes for a change of pace. Food is always a good idea and it has been awhile since I’ve let you in my kitchen. I joined an online group of 125 sketchers from around the world. One of the challenges was to look for unique angles so I walked around our house and found this view of our deck and greenhouse. One person in the group made an exquisite sketch using a chop stick and another using a twig. Here is a sketch of King Mountain Lodge near where we live. I used a genuine alder twig dipped in ink. It gives a nice variety of thin and thick lines. Holding an open pot of ink is a little scary and I was sure I would sneeze and have ink everywhere. This was a quick little sketch of about twenty minutes. While walking the golf course with my husband, I picked up a Canada goose feather to use as a dip pen too. Because it was Canadian, I thought it would be more cooperative, but it created a scary mixture of blobs and scratches more suitable for an ink blot test than a realistic sketch. We’ve had record heat in Alaska which makes glaciers melt, causing the rivers to rise. I sat between the Matanuska River and the highway and sketched this tributary flowing from the Chugach Mountains into the river. There are groups who get together to sketch around the world and it looks like so much fun. I’ve been organizing a group called Drawn to Palmer and we are planning to meet every month. It will be exciting to spend time with other sketchers and see different perspectives of other artists. During our last meetup, I sketched the Palmer Visitors Center in Palmer, Alaska. They have such a beautiful garden with Pioneer Peak in the background. I’m envious that they can grow foxgloves with just a bit warmer climate. Every now and then an email falls into my inbox and I smile. 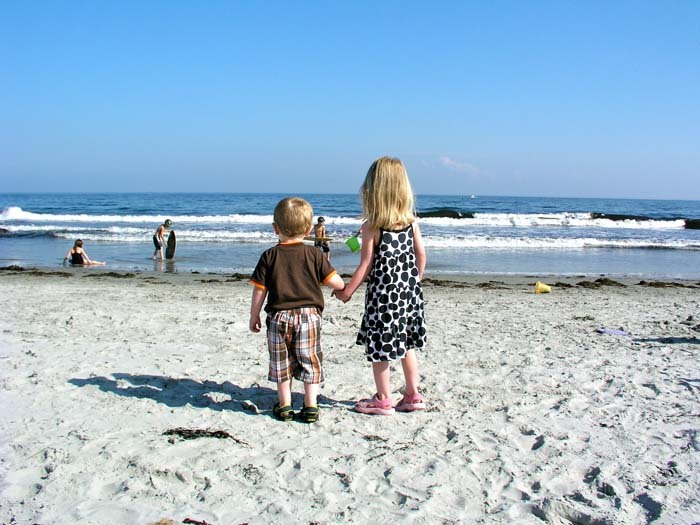 My niece sent me a note with a photo of her two children on a beach in New England. Would I be willing to paint it as an anniversary gift for her parents? Oh, my…yes! What I do with a photograph like this first is to just absorb it. It may sound odd, but I want to think of the sea, the breeze, and the birds before I even put the brush to paper. Next I crop the image, making the children the focal point and deleting anything that would distract from them. 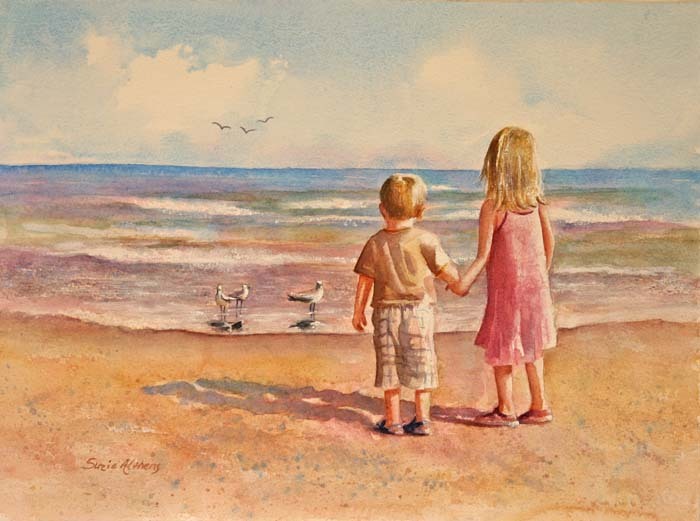 I wanted to give the children a more natural element to look at such as seagulls and I moved them closer to the water. Or did I raise the tide? I liked the plaid of the little boy’s pants, but the dots on the little girl’s dress were just too distracting. The blue of the sky and water is lovely, but I wanted more colors in the whole image so I washed a rainbow of colors through the water and sand.